In 1939, Monsignor J. Francis McIntyre, at that time Chaplain of the New York Chapter Knights of Columbus, and who later became Cardinal McIntyre of Los Angeles, California, seeing great numbers of women coming out of a Communist rally at Madison Square Garden, conceived the idea of a ladies organization to work with the Knights of Columbus. The New York Chapter Knights of Columbus formulated a plan for such an organization. Their plan called for the establishment of Auxiliaries in each Council and to coordinate the efforts of all under the direction of one parent group. 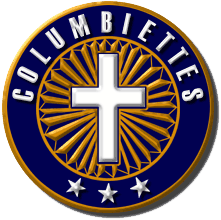 On March 2, 1939 the first Columbiettes were instituted in New York City. Since that memorable day, many new auxiliaries were formed and eventually State Councils and a Supreme Council were established. New members are initiated in these subordinate Auxiliaries and it is only through the integrity, strength and scope of these Auxiliary activities that the Columbiettes have become a recognized group of women working with the Knights of Columbus, promoting the ideals of Columbianism. Blessed Virgin Mary – Let us be ever mindful of the responsibility which is ours, by emulating her in her purity, and by imitating her as a Mother, for we, as Catholics know, that she is the foundation of all true motherhood. Saint Theresa, the Little Flower – In her great zeal to serve Almighty God, she welcomed any opportunity to make sacrifices. St. Joan of Arc – She was always ready to giver her aid unselfishly to those who defended a righteous cause. - The BLUE CIRCLE represents the World. by His Crucifixion He redeemed the World. All rights reserved. Designed by Brian Wych.